Nevada Field Trip, Day 5 – One Last Low Band Reading and a Steak Dinner. The weather report for our last full day at the ranch indicated afternoon showers, but clear in the morning until about noon. We decided to get one last 2 hr low band measurement taken in the morning. On our way back the previous day, we noticed a spot 15 miles south of the ranch that looked favorable. As we loaded the car, the tire pressure indicator warned us that we were low 5 psi in one tire. We exited the car, had a look, and discovered it to be worse than just 5 psi. The tire was half flat. Luckily, John and the ranch hands had not gone into the field yet and were still working in the area. So we asked them if they could help us with our tire. They pumped it up with air and then we easily heard where the leak was – on the bottom of the tire right in the middle and was caused from hitting one too many sharp rocks. The tire couldn’t be patched, it was a dead tire. John knew of a tire repair place in Austin, Nv, just 50 miles away. The man had a tire our size, and agreed to come up the road from Austin to deliver and install the new tire (actually a used tire). The deal was on. Raul and I drove to our observation site using the spare tire (not a full sized spare) and began setting up the morning’s observation. 10 minutes later, the repair man pulled up with his truck and proceeded to take care of our tires. Amazingly the whole ordeal only set us back about one hour. We thanked him profusely and paid him profusely, but it was worth it. He said, “this is my job, I fix tires.” And he was a very busy man indeed. He was one of the tire shops selected to patch the huge tires for one of the mining companies. He told us that those tires were very lucrative to repair. The sky was clear when we started but we knew it was going to be a race against time. Hour one: completed. Skies looking a little more ominous. Hour two of measurement began: how long would the sky hold off? We waited a bit too long and the high winds came. We furiously tried to shut down the computer cleanly, but the wind and now rain droplets were coming down too fast. Our shade structure twisted into a pile of rubble. We did manage to get the computer and instruments back into the car with no damage to them or us. We unpacked the car at the ranch, as it had not started to rain there yet, and repacked it properly. That hour of delay from the flat tire did cost us as we really needed that extra hour. As we were recovering from the earlier mayhem, the AC suddenly shut off and all was quiet – the power went out. OK, what next?! Fortunately, dinner was being cooked on the gas grill and we would not be denied our dinner. In the meantime, I went down to the hot spring hoping to cool off. The end of the pond away from the spring was indeed cool and it felt very nice to wash the dust off and cool off in the hot spring (luckily we are from Phoenix and have an altered sense of hot and cold). Showers at the cabin were out of the question as the cold water was too hot to stand under. We had a very nice dinner with the ranch manager John, with his wife, two daughters, the daughter’s 3 little boys (ages 3, 5, and 7), the daughter’s boyfriend (also the head ranch hand), and one college intern. We had great discussions about cattle, the history of the ranch and surrounding area, and of course, John wanted to know more about the topic we were studying. And to cap off dinner, the power came back on after being out for nearly 6 hrs. The day had a rough beginning, but a pleasant ending. We are now headed back to Arizona and are examining the data we collected. Nevada Field Trip, Day 4 – The Search Continues, but Nevada has a Monsoon Season as Well. We processed our data from the previous day and noticed that the high band antenna had considerable radio frequency interference (RFI), but that the low band was much quieter. To view the antenna response, we plot the antenna temperature (basically power) vs frequency. An ideal plot would be a smooth curve, but when RFI is present, there will be occasional narrow RFI spikes at various frequencies. The frequency of FM radio is in the range of 88 to 108 MHz. Despite the lack of FM reception on our car’s radio, the low and high band antennas picked up a forest of spikes in the Radio Band. It appears one can not escape FM radio. 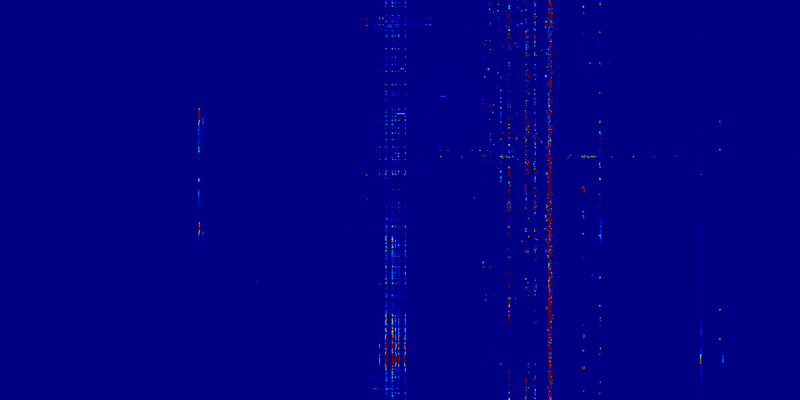 Other than FM radio, the low band interference was not that bad. We decided to use day 4 to search the area for other locations which were good in the low band, by using our small biconical dipole antenna and measure for 10 minutes for a NS orientation and 10 minutes for an EW orientation. We traveled a 180 mile loop around the area, stopping in various (4) places. The loop took us 9 miles north of the ranch on Nevada Hwy 21 (Grass Valley Rd) and then 21 miles westbound on another road (name unknown) to Hwy 278. Going south on 278 for 41 miles brings you to Eureka, the first decent sized town in the area. The next part of the loop is 69 miles of Hwy 50 (westbound), which meets up with Hwy 21. 40 miles of the gravel road Hwy 21 brings us back to Gund Ranch. We tried 4 locations. The first location was on the road whose name we are uncertain of. We were able to get in a full measurement. The second location was a few miles south on Hwy 278 near the Alpha ranch. Our measurement there was cut short by about 5 minutes due to a rain cloud that popped up suddenly. Our third measurement was 30 miles into Hwy 50. That measurement was called off due to rain before we could even set up. The fourth measurement was also off of Hwy 50, but about 5 miles north of there on a side road. We did get in some measurements on day 4 despite the rain. However, lightening did add spurious RFI to our data, and the data might not appear as clean as it should actually be. At the end of the day, the Ranch Manager, John, paid us a visit and confirmed an earlier invitation to us to have dinner with him and his wife at his house the next day (steak from his cattle), but there would be additional guests because his wife had reminded him that it was his birthday tomorrow! The EDGES program under Professor Judd Bowman is searching for a site which would be nearly as remote and quiet (in the radio frequency ranges of 50-200 MHz) as the current site in Western Australia, but slightly more convenient to get to for testing and development. The Global Epoch of Reionization (EOR) signal is very faint and must be carefully extracted from a bright sky almost 100,000 times greater in magnitude, so the fewer stray signals we pick up, the better our chances of successfully extracting the signal. It was for this reason that Raul Monsalve (post-doc) and I (PhD candidate) packed a nice new SUV rental with our antenna gear last Monday and headed off to the middle of Nevada. It’s a long trip, so we were forced to spend the first night in Las Vegas. And on the second day, via the extraterrestrial highway (318), we arrived at the Gund Research Ranch operated by the University of Nevada Reno. (http://www.ag.unr.edu/about/facilities/gund_ranch.aspx). During the drive on the second day, we were encouraged by the weakness (and most of the time the lack of reception) of FM radio stations. The ranch manager had a nice empty cabin available and was very hospitable. He showed us the boundaries of the ranch (100,000 acres when considering public and private lands) and told us of the hot springs in the area. One undesirable by-product of the hot springs is that the longer you let the cold water run, the hotter it gets, to the point of scalding. The ranch research focuses mainly on cattle, but people come to the ranch to conduct research on a variety of topics. He also pointed out several spots in the field that might interest us which didn’t have cattle roaming around that we might want to visit the next day. On the third day, we took the packed SUV out onto a field on the ranch property. The rancher warned us to get out of there asap if it started to rain, because the road would get slick as butter and we’d have no chance of exiting. The road consisted of two tire tracks without vegetation amid a field that was a forest of thriving desert scrub brush plants. After going into the field for about a mile, and fearing we might not come back out if we drove much further, we found a place to set up our antenna and take measurements. 2) A high band antenna sensitive in the range of 80 to 200 MHz. 3) A small biconical dipole antenna sensitive in the range of 50 MHz and above. After 2 hrs, we set up the low band antenna and took 2 hrs of measurements. We then switched antennas and took 2 hrs of measurements with the high band antenna. Because at 2 pm a few drops began to fall during the high band measurements, we decided to make the bi-conical dipole measurements in parallel to hasten our departure (we could do this because the dipole used a different piece of equipment than the low and high band antennas). If it really started to rain, there was no way we could shut down and get out of there in under 40 minutes, so we foolishly took our chances and completed all of our measurements. Luckily the few drops of rain stopped and we made an uneventful return to the ranch. We are now looking at the data we recorded and will update you on the results in the next blog entry. Hello LoCo followers! As the avid readers should know, the LoCo team is working on developing a ultra-sensitive radio telescope, EDGES, in order to detect faint emission signals from the very earliest stars and black holes that formed in the universe. Since the signals are so faint, EDGES must be the most sensitive instrument of its kind. However, the high response of the telescope to small signals can be disadvantageous, since there are many other radio sources that can “drown out” the desired signal. Most everyone has experienced this effect as static on a car radio. In this case, the EDGES frequency range actually includes the FM band, and the radio signals that you want to hear in your car is, to us, just like ‘static’ that interrupts your favorite broadcasts! In fact, astronomers call this unwanted interference ‘noise’ even though it is caused by electromagnetic waves instead of sound waves. Here at ASU, I am looking at the radio frequency interference (RFI) patterns that disturb our observations of the early universe. In figure 1, you can see a typical plot of the intensity at a given frequency during the course of the day. The X-axis is a plot of frequency, and the Y axis shows time at one minute intervals. 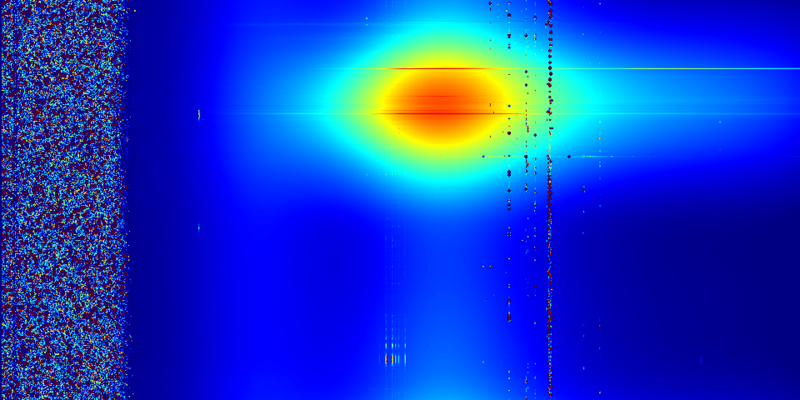 A red pixel shows that there was a lot of incoming flux at a given frequency, and blue shows a low level of flux. The large red sphere is actually the radio emission of our Milky Way galaxy. The vertical bands of high flux correspond to radio frequency channels that we humans use for broadcasting. Some of these bands are used for FM radio, some are used for GPS, and others are used for industrial or amateur radio communication (like cell phones or satellite TVs). The intensity of the RFI signals in these bands changes throughout the day for a wide variety of reasons. I am looking for times when the power is unusually high, and seeing if those events correlate to known environmental phenomenon. For instance, one of Earth’s atmospheric layers is composed of high temperature particles that have been stripped of their electrons and form ions, thus the layer’s name ‘ionosphere’. When a force perturbs this layer, the charges move around in wavelike patterns. Moving electrical charges radiate photons, and the frequency of the radiation is dependent on the frequency that the ions oscillate. If the ions oscillate at radio frequencies, then there will be an increase in radio photons coming from the ionosphere, and the EDGES instrument will record that event. Other RFI sources that cause noise in the data are meteor showers (that perturb the ionosphere), ionospheric clouds, solar flares, and geomagnetic storms. are reflected back towards Earth. Figure 2 shows a plot of the average critical frequency of the f1 layer of the ionosphere for each day from 2007 to present, which spans the time period that the EDGES instrument has been running. You can see that there are seasonal peaks each year, due to the orientation of the earth’s magnetic field compared to the direction of the sun. I am interested in finding the spikes in the data, to see if there are any peaks in the RFI intensity on those dates. As mentioned above, infalling meteors are known to cause perturbations in the ionosphere. Many of these meteor showers are spectacular to view with the naked eye, but a few are so faint that we only know they are there because of the disturbances they make in the ionosphere that have been recorded by other radio instruments. Figure 3 shows a plot of how many meteors are expected to hit the atmosphere for any given day. They are separated into ‘visible’ and ‘radio’ showers, based on whether they are visible to the naked eye or have been detected by radio instruments only. The X axis runs over one year only, since the Earth only runs into each group of meteors once per year due to our orbit around the sun. 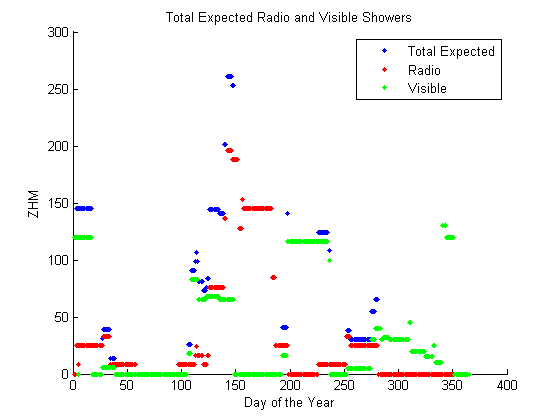 The Y axis gives the Zenith Hour Mean (ZHM), which is the total number of events predicted to occur during the hour that the shower has the most meteors. So far, I have been working on getting the data into a format that will be meaningful to do the comparison between. In the next few weeks I should start to see if there are any of the correlations between the ‘noise’ in the EDGES data and the events that happen in the sky above it. If this is successful, I can use the information to remove the events from the data so the astronomical signal we want to detect will be clearer. Wish me luck!